To understand Californians’ favorite methods for ingesting cannabis, Joshua Hoffman likens it to the different ways of experiencing music. Think of smoking cannabis flowers like attending a live concert, he said. The second most popular method — vape pens — is like listening to a CD on high-end speakers. A new study based on data gathered from dispensaries across the state attempts to capture how California medical marijuana users spend money at legal pot shops — an estimated $2.68 billion by the end of the year, according to Boulder-based research firm BDS Analytics. The most popular strain across the state is called Blue Dream. To continue the musical analogy, Blue Dream could be described as a mainstream band with music that manages to both bring you to your feet and put your mind at ease. Several Sonoma County dispensary workers said Blue Dream’s popularity could be attributed to the fact it’s widely available. “It’s such a balanced blend,” said bud tender Joanna Rojas, from behind the counter at Santa Rosa’s OrganiCann dispensary on Todd Road. California is a pot behemoth where more than one-third of all legal purchases of marijuana in the United States take place, according to the report. There are an estimated 1,100 dispensaries and 2,000 delivery services in the state, according to Greg Shoenfeld, vice president of operations for BDS Analytics. Sales data show California already looks like states where recreational use and production is underway because of the variety of products — particularly concentrates — available on the shelves, according to Shoenfeld. States with medical marijuana and no recreational sales typically have less variety, he said. Recreational use of marijuana for adults was legalized in California last year when voters passed Proposition 64. But there is no system yet for commercial production, and the state is expected to begin licensing commercial cannabis businesses in 2018. Compared to California, where about 34 percent of the nation’s legal marijuana is sold, Colorado, Washington and Oregon combined represent 41 percent of all legal sales, including recreational marijuana. When Colorado began sales of recreational cannabis in 2014, dried flowers represented 65 percent of all sales, and concentrates took about 13 percent. The popularity of concentrates has risen since then, to about 27 percent, a rise that follows improvements in manufacturing methods, according to Shoenfeld. In California, more than half of sales, 55 percent, went toward dried flowers, generating transactions worth about $375 million during the second quarter of 2017, which ended June 30. BDS Analytics tracks 13,000 different types of named strains. The top five sold in California were Blue Dream, Golden Goat, Durban Poison, Gorilla Glue and Green Crack. The second-most popular form of cannabis was concentrates, comprising 25 percent of all sales worth $169 million during that same four-month time frame. Concentrates are a fast-evolving category that includes oils, waxes and other substances, that are typically heated up and smoked. The extraction methods draw compounds out of the marijuana plant, such as the psychoactive compound, THC, as well as other cannabinoids like CBD, which by itself doesn’t get a person high. Chocolate is the most popular infused edible product, followed by gummy candies, which together generated nearly $40 million in sales from April through June. “For us, first and foremost, the flowers are the dominant seller,” said Surina Sisavath, general manager of Natural Cannabis Company, which runs the OrganiCann dispensary. More than half of customers surveyed at OrganiCann dispensary on Todd Road in Santa Rosa said they like more than one type of cannabis product, according to an informal poll conducted on a mid-September day by dispensary staff. More than half of the 260 people polled said they like to consume cannabis in multiple forms. About 77 percent of the customers said they like smoking pot the old fashioned way and about 24 percent said they like using vape pen products. Sisavath said the dispensary aims to offer a wide variety of flowers, about 75 different strains on a day last week. They mostly come from cannabis farms in Sonoma, Lake and Mendocino counties. On Wednesday, Carena Piccinotto, 26, of Rohnert Park, discussed the merits of the Candy Jack strain with a bud tender. Piccinotto purchased four different strains of cannabis flowers, all geared toward different times of day when she wants to be alert or to help her sleep. She pointed to the scars on her knees, remnants of surgeries she endured last year after falling from an ATV. “I took no narcotics,” Piccinotto said. 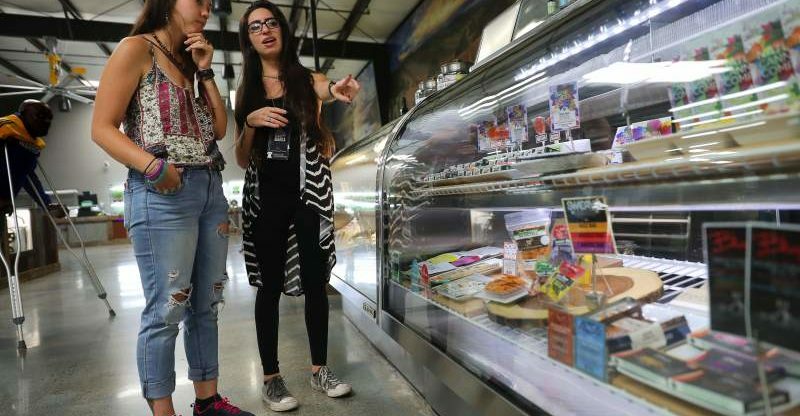 Across the way at the edibles counter, Catherine Jones, 23, of Novato was buying cannabis-infused cheese crackers to eat before flying to Los Angeles for what could be a stressful family visit. And at a kiosk for topical creams and ointments, Chuck Cadman, 80, of Santa Rosa was buying a sweet-smelling topical sports rub he uses on his arthritic knees.